The aerodynamic tractor-trailer combination enhanced fuel efficiency by a whopping 70%, consistently surpassing 12 miles per gallon in testing. (The base model 2009 Volvo VNL 670 got only 7 miles per gallon.) Powertrain brake efficiency was improved by 50%. Truckinginfo notes that Volvo's sleek aerodynamic design features a shorter front end than trucks currently on the road, and a downward sloping hood. Cameras replace rearview mirrors, and lightweight fairings run the length of the cab and the truck, for streamlined management of airflow. Two additional factors in better fuel efficiency are an enhanced version of Volvo's I-See, a new feature that memorizes thousands of frequently traveled routes and translates the knowledge into an optimized cruise speed, keeping the automated manual transmission in the most fuel-efficient gear possible at all times, and the downsized 11-liter Volvo engine, which features fuel-injection, cooling, oil and turbo-charging systems, and "wave" pistons. The truck also features a new waste-heat recovery system converts heat that is normally wasted as exhaust into torque, which helps to power the truck, for another way to boost fuel economy. 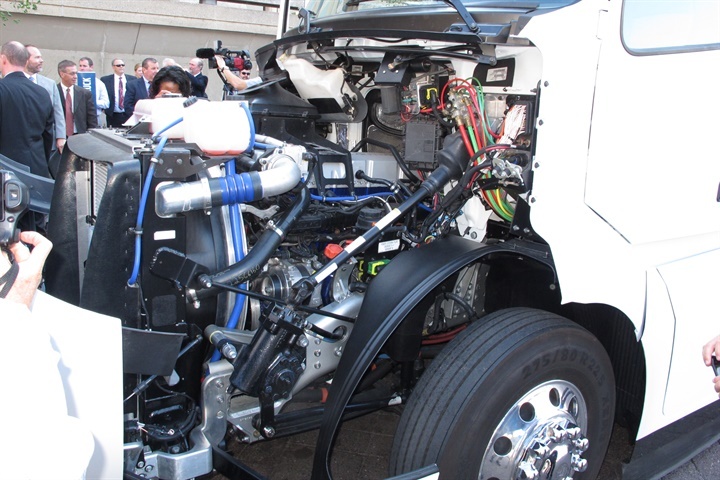 Although the truck touts great advances in several areas, the DOE recently announced a SuperTruck II program, and Volvo has once again been selected to participate. The new program will target 100% improvement on a ton-mile-per-gallon basis and a powertrain capability of 55% brake thermal efficiency. Stay tuned!